So it turns out that Facebook’s Trending News minions have been tipping the scales of “newsworthy based” on their personal political biases. Being from Silicon Valley, they were monolithically liberal. This upset the conservative sphere. But then Mark Zuckerberg and others invite leading conservatives to a meeting to hear their concerns — an extraordinary event and evidence that Zuck and his team rightly view Facebook as a global information provider that has a responsibility to all of it users. On the heels of news that Chromebooks outsold Macs in the first quarter, making ChromeOS the 2nd desktop OS behind only Microsoft Windows, Google announced that the Google Play Store will be coming Chromebooks later this year! A bill was introduced in the House of Representatives a couple of months ago which would put an end to anonymous purchases of prepaid cell phones and SIM cards. H. R. 4886: Closing the Pre-Paid Mobile Device Security Gap Act of 2016 would require lots of identification and verification when these devices are purchased. In a Medium piece entitled “Numbers Don’t Matter, Influence Does,” Gary Vaynerchuck explains why he focused all of the efforts around his new book entirely on Instagram users whose accounts show signs of engagement. 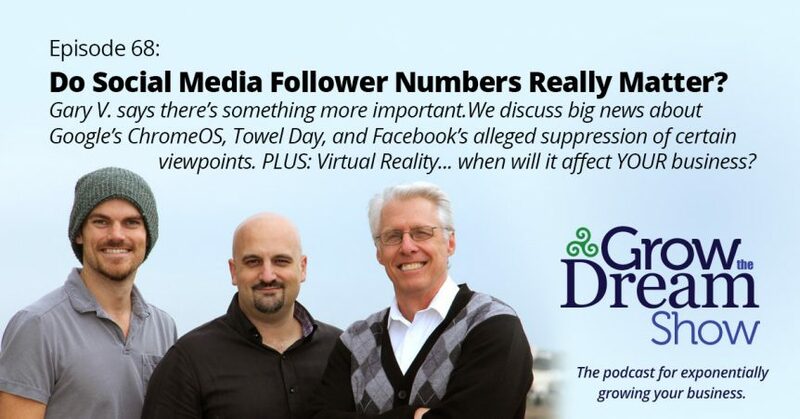 Gary V argues that their actual follower count was less important than their “influence.” David recalls the 1000 True Fans article by Kevin Kelly from 2008. When will Virtual Reality play a role in your business? Josh shares the story of Magic Leap, a Florida startup that has raised more than $1.4 Billion so far.